Many home gardeners have limited space. Master Gardener Janet Didur and Master Gardener volunteers designed an experiment to compare the yields of Carola potatoes grown in beds with those grown in a variety of containers. The goal was to provide information to the home or patio gardener who might be limited by a small space. We chose Carola potatoes because Janet had excellent results with them in a Zone 17 coastal climate. This medium-sized potato can be enjoyed roasted, mashed (with or without skins), steamed and added to soups and stews. Its rich, creamy white texture is certain to be a favorite with all the family. 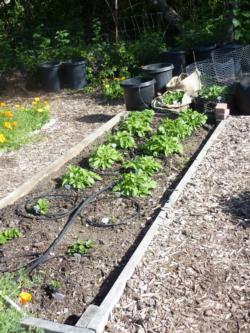 Potatoes grown directly into the ground will provide a better yield by weight than those grown in containers. Organic Carola seed potatoes were planted on March 16, 2010 at Elkus Ranch as follows. Ten were planted directly into a raised bed, three in a burlap bag with an 18” diameter, three in ½ “ galvanized steel hardware cloth (wire) with an 18” diameter frame and two in a 10 gallon plastic pot. 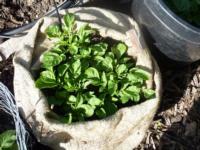 On March 23, 2010, three Carola seed potatoes were planted in a commercial potato bag (Com Bag). All potatoes were planted 3” deep. The potatoes in the containers lay on 6” of soil. The soil in both bed and containers consisted of a combination of 50% compost and 50% Elkus Ranch dirt. Due to a wet, cold spring irrigation was not initiated until March 30, 2010. The potatoes received water for 10” every fourth day. Irrigation was adjusted to 15” every second day on April 6 in anticipation of a sunny week. This was readjusted on April 13 to 15” every fourth day. Rain and unseasonable cold temperatures continued into early June. 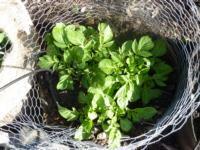 The first potato sprouted in the burlap bag on March 30, two weeks after planting. Sprouts were observed on April 6 in the bed and all containers except the potato bag. 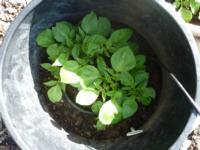 The potatoes in the bag (planted one week later than the others) sprouted the following week. The plants were measured on April 13, four weeks after planting. All were healthy and robust with no sign of biotic damage. Com Bag: height 1”, width 2”. Measured on April 23, four weeks after planting: height 3”, width 3”. Potatoes were hilled as needed with a combination of rice straw and garden soil when they exceeded 10” to 12” in height. Hilling occurred on April 23, May 4, May 25 and June 15. The potatoes required frequent hilling as the rice straw compacted. Harvesting in the bed began on June 15 and continued until July 13. All potatoes were harvested from the containers on July 13. Total yields follow. Severe gopher damage was observed in the potatoes harvested from the raised bed. It is difficult to estimate the amount of loss, but approximately 15% of the potatoes had been chewed on and an unknown number completely devoured. This affects the total potential yield which would have been higher had the protective hardware cloth under the bed not been compromised, allowing the gophers access to the potatoes. Despite the loss from ravenous gophers, the highest yield of potatoes came from the bed. Although the wire frame produced the most potatoes of all the containers, it yielded only 30% of that produced in the bed. The plastic pot and potato bag yielded approximately 25% of that produced in the bed. The low yield from the burlap bag is a bit of a mystery. 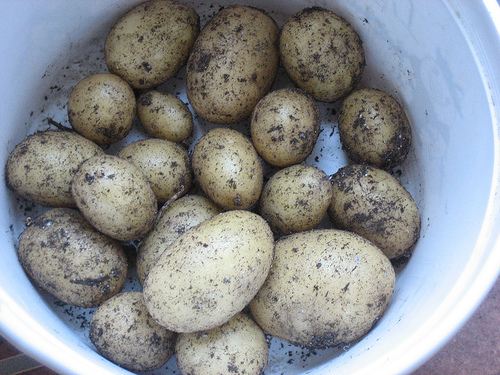 Janet enjoyed two- and three-pound harvests this year at home using the same method, but different potato seed (‘Purple Viking’ in this case). It may be that the Carola variety does not do well in burlap. Unusually cold, wet weather affected the entire potato crop at Elkus Ranch, producing low yields all round. However, the raised beds had the biggest yield by far, out-producing the containers by over 70%. If space is not an issue, raised beds will provide the biggest harvest.